AHA! The king of the (North) Norfolk radio waves has managed to land another TV gig at none other than the BBC itself. Alan is back on the gravy train as co-anchor of This Time and will be delighted to share his 'unique' presenting style with the nation, along with lots of digs at those who thought he was all washed up after his book was pulped. The series provide plenty of cringe-inducing belly laughing with quotes we'll be using for years to come – and you can watch Alan Partridge online from anywhere you happen to be. Watch This Time with Alan Partridge online: when's it on? 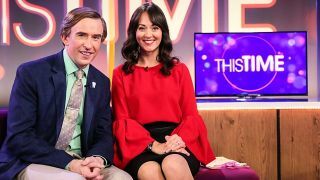 This Time with Alan Partridge is here to give Steve Coogan's most popular character a comeback on - where else - the BBC. It's on BBC One at 9.30pm GMT on Mondays and we're expecting a series of six episodes in total (starting from February 25). Following on from Steve Coogan's Mid Morning Matters, Alpha Papa and Alan Partridge's autobiography – the same writing team are back, including Neil and Rob Gibbons, to open this new special. So hopes are definitely high for side–splitting fun. That's right Partridge naysayers - smell my cheese, you mothers! Alan last presented live television in the nineties, but that was axed after he accidentally shot and killed a guest live on air (oh Alan!). So expect there to be a few teething problems for this comeback. But, no doubt, it will end up being as hot as the innards of an apple turnover. The mock–live show, which sounds similar to The One Show and expect to see familiar faces like Alan's assistant Lynn – whose life is "technically not worth insuring" according to Alan – played by Felicity Montagu and the more recently added Sidekick Simon played by comedian Tim Key. Watching in the UK is easy enough thanks to BBC television and the BBC iPlayer, but for those outside the country you can still watch Alan Partridge online by using a VPN service. How to get one of those, and which is best for you, can be found out below. To watch This Time with Alan Partridge in the UK, you simply need to have paid your TV licence and have a connection to a BBC One broadcast. It's also possible to watch the show via the internet live using BBC iPlayer or TVPlayer.com. You can also watch the show after it has aired using BBC iPlayer which is on a host of devices including smartphones, tablets and smart TVs. And if you're outside of the UK but still want to watch This Time with Alan Partridge online as it goes out, then there's an easy way to get around any geographical restrictions. Read on to take advantage of our nifty little VPN workaround. If you're out of the country but still want to watch This Time with Alan Partridge live, it's still possible - and without too much faff. You can get around geo-blocks and watch via a dedicated TV streaming website as long as you appear to be in the UK. This is possible using the combination of a VPN and TVPlayer.com. Simply open the VPN app, hit 'choose location' and select anywhere in the UK - it's super easy to do. The TVPlayer.com service is free and the best legal way to stream every minute of This Time with Alan Partridge. It's a really robust service and provides excellent picture quality, too. Alan has had a glittering career before this BBC appearance, of course. And you can enjoy every hilarious minute by watching old episodes of Knowing Me, Knowing You, I'm Alan Partridge and the feature film Alpha Papa – all online right now. Here's how. Lots of classic episodes of Alan in his prime are available in the form of his hit interview show Knowing Me, Knowing You. You can watch this online in a number of ways. There are plenty of clips and guest interviews on YouTube for quick and easily digestible tidbits. For full episodes head over to either Netflix, Google Play or TalkTalk TV. Thanks to the massive popularity of I'm Alan Partridge you watch the old episodes back online now – and yes, they're still funny. Your options include: Netflix, Amazon Prime Video, Apple TV, PlayStation, Google Play or Microsoft.